Spending the day in the Olympic Park is a bit like going to a theme park in the off season. A Russian friend who met us at the Coastal Cluster on our second day in Sochi described Olympic Park as a cross between Disneyland and VVTs, the All-Russian Exhibition Center in Moscow that in the Soviet era featured pavilions representing the accomplishments of the Soviet Union’s 15 national republics. I agreed with him in principle, but I had never seen either of those places so empty. Walking through the broad avenues of the park and standing in the central plaza, it seemed as if the Games had not yet begun. 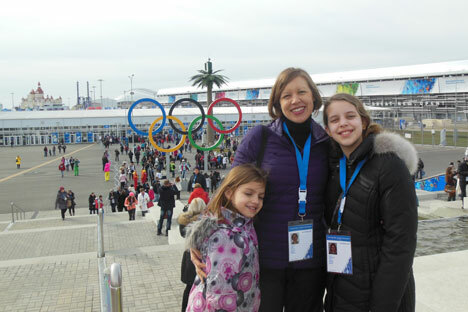 The longest line was in front of the Olympic souvenir megastore – where we managed to wait an hour and a half. The lack of attendance was a shame, because on Sunday we witnessed two of the most thrilling moments in the first weekend of the Games. In the Adler Speed Skating Arena, Russia took its first medal – a bronze – when Olga Graf raced to a personal record in the women’s 3000m. The event started off a little slowly – 3000m is a long race for speed skating and it’s done in pairs (the skaters who have the fastest times posted after 14 heats win the medals), so it’s a little hard to get into. But Russia had three skaters in the race and as the event wore on and times began to fall, the crowd got more and more excited. Practically the only country represented in the arena besides Russia was the Netherlands, and they cheered like mad for the Olympic champion, Ireen Wust. But this was nothing compared to the chants of the home crowd when it became clear after the final heat the Graf had held her place. Leaving the speed skating arena, we had 90 minutes before our next event – figure skating team finals – began at the Iceberg. Although this would have caused me serious stress in the Mountain Cluster, getting around the Coastal Cluster was far easier. It was about a 30-minute walk for spectators arriving at the Olympic Park train station through a security checkpoint and over a rainbow-colored bridge (yes, note the irony) to the central plaza. This plaza is the center of Olympic Park, where concerts and medal ceremonies are held; the major stadiums are arranged around it in a semi-circle. I found the Iceberg skating arena the most impressive of the five big stadiums on the coast. Its blue shell is broken up into cubes, and a 3D light show is projected on it at night. But on this night, there was far more excitement outside than inside. Aside from hockey, figure skating is arguably the best-known sport in the Winter Olympics and after the preliminary round in the team competition, Russia looked set to regain its former glory on the rink – led by veteran Evgeny Plushenko and newcomer Yulia Lipnitskaya. It became clear very early into the competition that no one could top the Russian team, but the crowd watched every performance from the edge of their seats. When the scores were finally announced for the final ice dancers, Meryl Davis and Charlie White of the U.S., and it was official that Russia had won the gold, the stands went wild. I wish the medal ceremony had been right then and there. The medals are awarded for almost every event a day or two after the competition ends and we weren’t in Sochi long enough to see a medal ceremony. But seeing Russia win its first gold was certainly satisfying enough. Then, with a final mad rush through the souvenir store to buy the accessory of the Games – a pair of white mittens with multicolored fingers – and the obligatory picture in front of the flame, my Olympic dream came to an end.